A collection of stories that will enlighten readers on the fascinating and often tragic history behind the blue jeans they wear, the French fries and chocolate they consume, and the pepper and sugar they use for flavor. 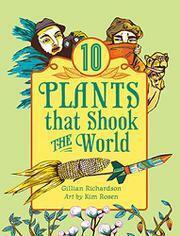 Richardson presents brief but informative overviews of the impact 10 plants had upon history and civilization. The only plant readers may be completely unfamiliar with is cinchona, the bark of which is used to produce quinine for malaria. How cotton affected the slave trade, how papyrus enabled the wide dissemination of knowledge, how rubber revolutionized transportation, and how pepper—or the control of its trade—provoked wars are among the stories told. A superfluous fiction scenario begins each chapter and is followed by informational text about the plant, its historical background and now-familiar applications. The tea chapter is representative, leading off with “Edward” at the Boston Tea Party and then tracing tea’s spread from China and Japan to Europe, exploring its role in the opium economy, describing its processing and explaining its social significance. Color illustrations serve more of a decorative than explanatory purpose.